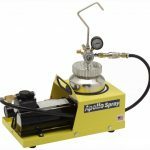 Experience 80%-90% TE (Transfer Efficiency) and a cleaner work environment with Apollo Sprayers Turbospray HVLP spray systems, the easiest to use HVLP spray finishing systems available. Apollo’s gentle warm dry turbo air ensures no moisture contamination in your finish or your work. 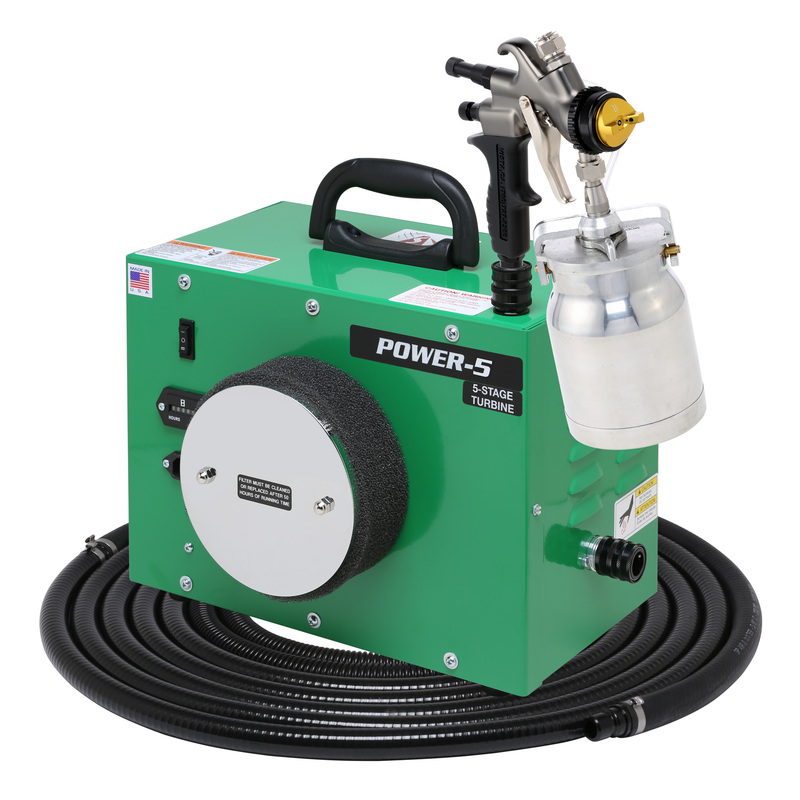 For the ultimate in turbo powered HVLP Apollo Sprayers the NEW POWER-5 provides the ultimate atomizing pressure to ensure the perfect finish every time! If you spray higher viscosity or more difficult to atomize finish products you will be amazed how the POWER-5 can atomize those finishes, all with the least amount of overspray. Realize 80% – 90% efficiency on every job. Add gelcoat and custom faux paints to the long list of products you can spray with Apollo POWER-5. 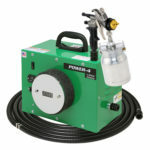 The POWER-5 will support multiple spray gun operations with a Y-connector. All POWER Series systems come with the Handi-Hold® Spray Gun Docking Station, an Apollo innovation. 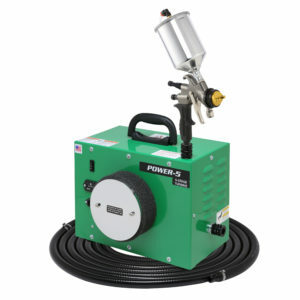 Store, hold or transport your spray gun in a vertical position with no risk of knocking it or it falling over. It’s ready to spray when you are. SPRAY GUNS: The POWER-5 is available with the All-NEW AtomiZer® 7700 non-bleed spray gun in 1 Quart Bottom Cup, 4 models of Gravity Cup (90cc/250cc/600cc/1000cc) and an 8oz Mini-Cup. The POWER-5 comes with a three position on/off switch, which also gives you two separate power levels. In the “down” position, the turbine will give you “LOW” power or about 5.0 psi. In the “up” position the turbine will provide you with “HIGH” power or about 10.0 psi. We have also included an hour use meter in this new version, which will help you to keep more accurate record of your turbine maintenance when used in conjunction with your “Record of Turbine Maintenance” located in your instruction manual. The POWER-5 is also fitted with anti-vibration feet and a cool comfort carrying handle. All our components are precisely made to make a perfect fit. Perfect parts make perfect equipment, which leads to the perfect finish. 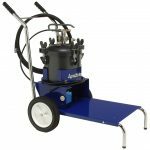 Apollo warrants that all new POWER SERIES Turbo systems purchased from an Apollo Authorized Dealer will be free from defects in materials and workmanship for the period of 2 years by Apollo Sprayers International, Inc. This 2 YEAR LIMITED WARRANTY (Parts & Labor) covers the Turbo, hose and spray gun. All POWER SERIES Turbo systems are also eligible for an extended warranty of one (1) additional year by registering your POWER SERIES Turbo system online within 30 days of purchase. Apollo’s exclusive warranty covers parts and labor for the full warranty period. 27 foot (8.3 meter) flex air hose.